The Wii offers a great platform on which to play some really exciting equestrian games. Horse games for Wii range from summer adventures at an academy to a chance to learn all about breeding in a fun and educational manner. We list of all of them that we have reviewed here. 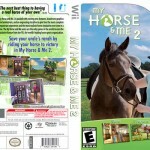 Wii horse games help players to develop critical thinking, decision making and social skills. Games within games provide plenty of variety and training for competitions, keeping it all exciting. Wii games range in price, and complexity, so it is important to purchase games that are not only suited to your interest but also your ability. This game provides a complete equestrian experience in the most realistic of graphical environments with true-to-life animations that enables players to develop strong bonds between them and their horses.